CDI honored in Chicago today as 2015 Tom Camerlo Exporter of the Year. 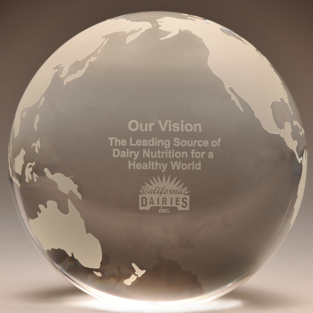 In 2013, California Dairies, Inc. (CDI) gathered more than 100 mid-to-upper level employees to unveil a revamped strategic plan just approved by the CDI Board of Directors. To commemorate the event, employees were given a curiously heavy cardboard gift box. They opened it to find a crystal globe, wrapped in black satin. That got a chuckle. But the keepsake globes, measuring 4 x 4 inches and weighing 3.5 pounds, sent a serious message: California’s largest dairy processor was staking much of its future on exports. Today, at the USDEC Annual Board of Directors and Membership Meeting in Chicago, CDI was publicly honored as the Dairy Foods magazine 2015 Tom Camerlo Exporter of the Year. Sponsored by the U.S. 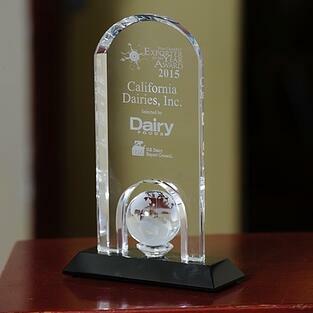 Dairy Export Council, the award recognizes companies that demonstrate leadership in driving global dairy demand and U.S. dairy exports. The award is named after the late Tom Camerlo, who, among other industry leadership positions, served multiple terms as chairman of the U.S. Dairy Export Council’s board of directors. 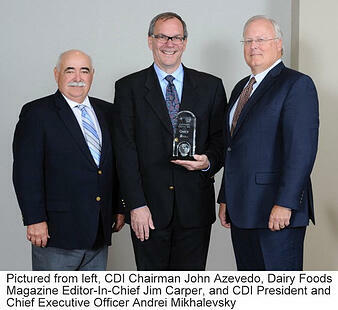 “This validates CDI’s vision to become the leading source of nutrition for a healthy world,” CDI chairman John Azevedo told USDEC members after Dairy Foods editor Jim Carper presented the award. "This recognition would not be possible without the foresight of the CDI board of directors and the wisdom of CDI member-owners to invest in their cooperative." Not a leading source, but the leading source. When the CDI Board of Directors named Mikhalevsky president and CEO in 2012, it got an ambitious international businessman who racks up frequent-flyer miles with a last name on his U.S. passport that some find difficult to pronounce. When he came to CDI, Mikhalevsky brought more than 35 years of international business experience, having lived in more than 20 cities around the world. His resume included five years as the managing director of global ingredients and foodservices at Fonterra Co-operative Group Ltd., the world’s largest dairy exporter, where he was responsible for building Fonterra’s global customer partnerships. The only continent he hasn’t done business in is Antarctica. Erba was there when the plan was presented to the CDI board. But executing the plan would require a not-so-easy culture shift of the entire organization. That’s one reason the organization gathered so many middle managers when the strategic plan was released. Like a good real estate agent, Mikhalevsky sees three major advantages of being in California: location, location, location. Plants are located close to the major shipping ports of Los Angeles, Long Beach and Oakland. After clearing testing, a CDI product can be loaded on a ship the next day. Like all U.S. dairy exporters, CDI has had to weather a challenging year of volatility in global markets. Prior to 2015, annual U.S. dairy exports set new records for five consecutive years, increasing U.S. sales to more than $7 billion in 2014. If CDI would have strayed from its commitment to continue exporting, particularly powder, at competitive prices, the downturn would have been worse—not just for CDI, but total U.S. exports. In the first seven months of 2015, exports were equivalent to 14.4 percent of U.S. milk production on a total milk solids basis, down only slightly from 2013-14, when 15.4 percent of production was exported, according to the U.S. Dairy Export Council. 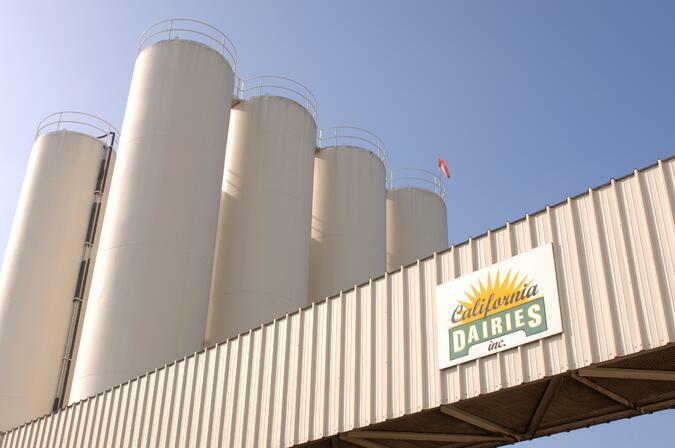 Along with three other co-operatives—Agri-Mark, Inc., O-AT-KA Milk Producers and United Dairymen of Arizona—CDI is a shareholder in DairyAmerica, which markets milk powders internationally, as well as in the United States. Bettencourt said CDI visits major global customers once or twice a year to assess how they are testing, storing, using and transporting CDI products. “You can’t just pick up the phone like you can sometimes in the U.S. to resolve something,” said Bettencourt. “You need to go see it to understand it. Sometimes the specifications say one thing, but there are variations according to various markets. When that happens, we don’t expect our customers to change. We try to adapt and change. Among the six plants, Tipton and Visalia focus most on export products. 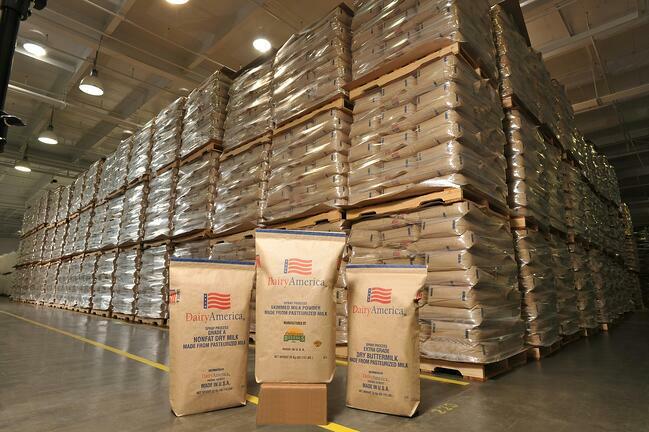 Tipton is one of the largest plants in the nation with capabilities that include powdered milk, butter and production of a variety of condensed products. The Visalia plant is equipped with the largest single evaporator-dryer in North America. To fulfill the mission statement’s mandate to “profitably market, process and add value to members’ milk,” CDI is creating more value-added export products. In three years, it has nearly doubled its product portfolio, and is investing for more expansion. CDI added anhydrous milkfat in 2012, cream cheese in 2014 and milk protein concentrate and isolate this year. The addition of a third evaporator at the Visalia plant moves CDI’s export powder portfolio up the value chain and into higher-specification powders. The new evaporator produces low-spore NFDM and SMP, in addition to high-heat, heat-stable and low-spore milk powders for UHT applications. “Innovation and new product expansion are driving this mission,” said Mikhalevsky. Exports have become so important to CDI "we can’t exist without it," said Mikhalevsky. He credited USDEC for ongoing assistance. Those globes are proudly displayed on bookshelves and desks throughout the company. Intended to be aspirational, the crystal keepsakes appear almost magical when illuminated by a California sunbeam streaming through an office window. Downloadable profiles of previous winners are on the USDEC Exporter of the Year page. The U.S. Dairy Export Council fosters collaborative industry partnerships with processors, trading companies and others to enhance global demand for U.S. dairy products and ingredients. USDEC is primarily supported by Dairy Management Inc. through the dairy farmer checkoff. How to republish this post.